Madison, Wisconsin. 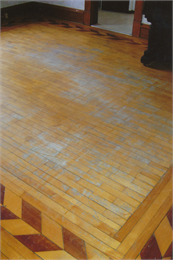 Decorative wood flooring as found in the Memorial Union is common throughout all types of historic buildings. Source: Photographer Ginny Way. Wood is the most common material used for floors in historic houses and commercial buildings. High-quality and long-lasting woods such as oak, maple and fir were used for floors because they are both durable and attractive. An original wood floor is a significant character-defining feature in a historic structure. If your house or building has an original wood floor, you have several options for the historic preservation and restoration of your floor. Wood floor boards were cut in various widths and usually grooved to fit together. The boards were blind-nailed to the floor joists. Floor boards could be applied directly to the joists underneath or to a subfloor, with the boards laid perpendicular or diagonally over the joists. During the 19th century, wood floors were left bare and swept, scrubbed and sanded clean, or they were polished by hand with linseed oil and beeswax. Synthetic resins were used as floor finishes as early as 1900. These synthetic materials included cellulose nitrate, cellulose acetate and by 1910, phenol formaldehyde. However, these early synthetic coatings were not as stable as the natural resins. By the 1930s, vinyl acetate and acrylic were introduced as wood floor finishes. Although natural finishes are not as durable as synthetic ones, they are easily maintained with repeated application. Natural finishes give your floors their unique appearance and patina which should be preserved in any restoration project. In addition to being functional, wood floors can be made highly decorative with inlaid woods. This technique is known as parquet. 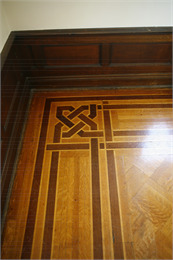 Parquet floors are often a feature of certain house styles, such as Queen Anne and Colonial Revival. The original wood floors in your historic house or building may be covered with carpeting, linoleum or other materials. 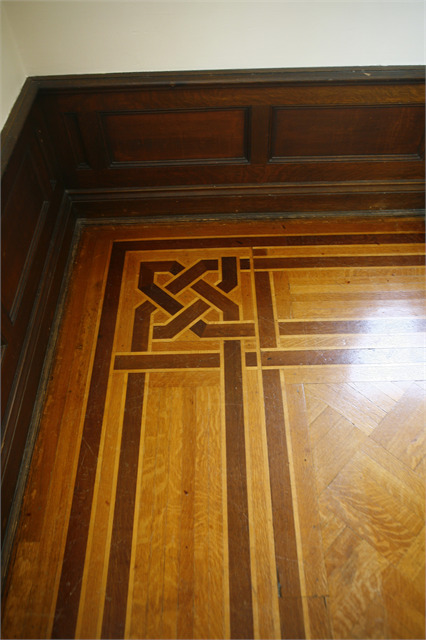 If your wood floors are concealed, you may want to restore them to return an important historic feature to your building. You can expose a small section of your floor to evaluate the existence of wood flooring and assess its condition. Hardwood floors are superior to most flooring materials available today and can add value back to your building. Restoring your wood floors may be relatively simple or require professional assistance. You should do the minimal amount of work necessary to restore the appearance and luster of your floors. Your floors may only require cleaning with an appropriate detergent cleanser, surface buffing and the application of a wood sealer. If your wood floor is damaged or has missing sections, you can patch these sections with new wood that matches the original wood as closely as possible. If your wood floors have many layers of old finish or wax, then you may need to use a chemical stripper to remove these layers before you apply a finish. You must apply the chemical solution or product directly to the floor surface, let it soften the existing surface layers and then scrape and remove the residue. When you have stripped off the finish layers down to the wood, you can apply a compatible finish, such as an oil-based varnish or polyurethane. The finish that you apply will depend on the current finish. You can apply a modern polyurethane finish over older varnish finishes, but you cannot apply an old-style varnish finish over a modern polyurethane finish. If your floors have a modern finish, you cannot return to the historic varnish finish; you must keep the polyurethane finish. If your floors still have a varnish, you can strip and apply a new varnish or a modern polyurethane finish. If your floors are particularly uneven or worn, you may want to consider sanding them before you stain or seal them. However, most historic wood floors cannot endure multiple sandings, so you should determine whether your floors have been sanded before. Most wood flooring is made of tongue-in-groove construction. The upper and lower grooves or “tabs” are about 1/4 inch thick. Some original wood flooring made of lower-grade pine has a hardwood veneer that was usually milled at just ½ inch thick. The strips of hardwood are usually narrow (typically 1 ¼ to 1 ½ inches wide) and face-nailed to the floor. If you have tongue-in-groove or veneer wood floors that have already been sanded once or twice, re-sanding them may not be an option. A typical groove is ¼ inch and a typical sanding removes 1/8 inch, so a tongue-and-groove floor can only take two sandings before the groove will be sanded off and expose the tongue and nails. If your floors cannot take another sanding, consider a light screening instead. Screening is done with a drum sander that has a light buffer pad rather than abrasive sand paper. This method removes layers of old wax and lightly buffs any scratches in the wood, but it does not diminish the depth of flooring. Outagamie County. The finish on wood floors can deteriorate with years of wear. Solid wood floors can be lightly sanded and refinished to restore the original appearance. Source: WHS - State Historic Preservation Office. Preserve and maintain your original wood floors. If your building has its original wood floors, do not cover them with non-historic materials. Maintain these surfaces to preserve the architectural integrity of your building. If your wood floor has not already had a modern finish applied to it, use a traditional finish to maintain it. Clean and restore your floor finishes. Use the gentlest means possible to remove non-historic coverings from your original wood floors. Remove paint by hand-scraping the wood. Apply putty to nail holes. Strengthen partially decayed wood by applying semi-rigid epoxy. Allow the epoxy to harden before you sand the wood and apply a natural finish. Replace damaged wood boards. If your wood flooring has damaged boards, you may be able to salvage pieces of wood flooring from secondary areas of your building, such as the floor of a closet. Remove the damaged boards and carefully fit the replacements in. Secure the new board with nails and finish it to match its appearance to the existing floor boards. Sand your wood floors only if necessary. Sanding removes the original surface of wood flooring. Most wood floors can withstand only one or two sandings before they start to splinter or expose nail heads. You should only sand your wood floors if they are heavily stained or cannot be effectively stripped with a chemical stripper. The information presented here is not intended to provide comprehensive technical advice or instructions on solving historic preservation issues. Any information contained or referenced is meant to provide a basic understanding of historic preservation practices. Read full disclaimer.